It's Wednesday, so it's time for the Carnival of Education! This week's Carnival is hosted by Mathew and his site Creating Lifelong Learners. There are some interesting posts, including one by Mrs. Bluebird about what her students are REALLY saying when they talk about the weather, and this one over at Joanne Jacobs that asks if it's OK to pay students when they do well on tests. I've certainly considered that one myself. Hey, if you haven't seen Fractorix yet, go check it out right now! And if you HAVE seen Fractorix, why the heck haven't you commented on it yet? Chop chop, get to it! And while we're talking videos, let me humbly submit one of my very first attempts at a school-related video. This one is called, "Kids, Don't Tattle." Tattling has really gotten on my nerves this year, as I have several students who would rather tattle than breathe. This week's Mr. Teacher column over on education.com is all about those kids who are supposed to wear glasses, but don't. You know what I'm talking about. There are some pretty cool styles of glasses out there nowadays! It's not like today's kids are wearing 3 inch thick coke bottle specs. But some of them would just rather have blurry vision I guess. Anyway, check it out and leave some feedback! What's your favorite topic to teach? To celebrate my ginormous overnight increase in RSS subscribers, I was thinking about some ways to get my posts a bit more audience participation. I truly appreciate everyone that comments, and I was hoping to get more people involved. I will pose a question, and then give my own answer, and then I welcome everyone else to submit their own responses to this question. Within the material that you teach (or have taught), what is your favorite topic and why? For me, there are several aspects of the math curriculum that I enjoy teaching. This week in fact is one of my favorite topics, geometry, which at a third-grade level, is identifying two-dimensional and three-dimensional shapes. It's hard to get kids to differentiate between pyramids and prisms, but it's always enjoyable and relatively simple. But I have to say that my favorite part of the year comes when science class focuses on the solar system. I really enjoy talking about planets and demonstrating what rotations and revolutions look like. And when I name of some of the moons of the other planets, like Phobos and Deimos, Ganymede, Io, etc, the kids go into hysterics. Which is quite ironic, considering some of the names these kids have been blessed with by their parents. I also like talking about the solar system because I get to mask my giggle fits when the kids start talking about Uranus. OK, the floor is open to discussion! Thanks in advance to all participants -- no lurking allowed!! On Friday, Ms. Jenn Ed and I were scheduled to have our second Lunch Bunch, for the kids in our classes who had done all of their homework for the previous three weeks. You may recall, the first time we did Lunch Bunch, we had a whopping 11 students (out of 41 on our rosters) who had done all of their homework. This time around, we saw a massive increase, as the Lunch Bunch swelled to THIRTEEN students! Unfortunately, I had an extremely long day on Thursday -- I was at the school from 7 a.m. until 8 p.m. -- and I just didn't have the energy to run by the store that night to buy ice cream. So Friday morning, I informed the kids that we would be moving the Lunch Bunch to Monday, when I would have a chance to get ice cream. They told me, almost unanimously, that they didn't care about the ice cream. They just wanted to do the Lunch Bunch with their teachers. I say ALMOST unanimously, because one of the little bratty girls in my class began shouting that she DID care about the ice cream. I had to force myself to use a gentle tone while reminding her that she was not in fact a member of the Lunch Bunch, and that her opinion on the issue mattered less than my opinion on No Child Left Behind. So we had our Lunch Bunch, and it was a stellar affair full of revelry. I even bonded with one of my kids over our mutual taste in comic book superheroes. As part of their lunch, all of the kids had gotten Ring Pops. Several of them were holding them up in the air exclaiming, "Look! We're superheroes!" I mentioned to the boy sitting next to me that only the kids with GREEN Ring Pops were really superheroes, because they could be the Green Lantern. The boy looked at me with disdain and stated, "I don't care about the Green Lantern. I would rather be The Flash." In case you're not aware, I have a strong affinity with The Flash. I've always loved that character, and that was even my perennial Halloween costume for about six years running, no pun intended. So I looked at the boy with newfound respect and asked, "You like The Flash?" He nodded, and then said in his pristine French accent, "If Superman and The Flash had a race, The Flash would win. I think it is because The Flash is the master of running, and Superman is the master of flying." That boy is going to go far. In sadder news, I lost one of my little sweethearts on Friday. One of our apartment complexes closed over Christmas break, and all of the residents had to move. Unfortunately, this little girl in my class moved to a nearby apartment that feeds into ANOTHER elementary school. When our office discovered this, they withdrew her. I was in a meeting late Friday afternoon, and I got back to my room just minutes before three o'clock. Just in time to see the little girl walk out of Ms. Jenn Ed's classroom in tears. She walked up to me, gave me a big hug, and said, "I sure am gonna miss you." I sure am going to miss her too. She was an island of sweetness and behavior in this year's choppy waters of insolence and apathy. Saw an article in the paper today that said a nearby school district, Lake Dallas, will be staggering their end-of-year date next year. Everyone will start on August 25, but only the students who pass the TAKS will finish school on May 22. Those who do not pass TAKS will go an additional two weeks and finish in June. How great is this? I can't wait to see how works out, because I think this could actually be an incentive even to those completely apathetic kids that seem to be filling the seats nowadays. Sometimes it seems like failing grades mean nothing to them, having privileges taken away means nothing to them, even being held back a grade means nothing to them. But who in his right mind doesn't want an extra two weeks of summer vacation??? Man, if I was on the board of education in my district, I would be putting this plan into action TONIGHT. Just think how it will affect the teachers, also. It won't be an extra two weeks of vacation for them, but during those two weeks, they will have much smaller classes, and they can really focus intensely on getting those kids up to speed. Yours truly is the guest of honor over on another blog today --So You Want To Teach? Joel has graciously allowed me to post a top 10 list over there. It's the Top Ten Rejected Meanings of TAKS. Coming soon, to a T-shirt near you. Well, well, well, 2008 is shaping up to be a very busy year! On February 7, I will be the guest speaker at my old high school's National Honor Society induction ceremony. I have absolutely no idea how I'm going to keep a group of 300 or so high school students interested in what I'm saying, but as long as I can find some way to keep the flop sweat from showing too badly, I think I'll survive. It's still a few weeks away, so I'm not a raving lunatic of anxiety just yet, but we're getting there. On March 12, I will be hosting the Carnival of Education here at Learn Me Good! I figured it was about time for me to step up to the plate and throw the party at my house. By the way, the current episode of CoE is up and running over on The Median Sib. Stop by and grab some hors d'oeuvres. On April 5 and April 7, my dad and I will be attending the Final Four at the Alamodome in San Antonio. It's been 11 years since we were there last, and we had a blast. I'm expecting more of the same this year -- and if the Duke Blue Devils somehow find their way clear to joining us there, well that's just gravy. Over the summer, I plan on working intensively on the sequel to Learn Me Good, tentatively titled Learn Me Gooder. I'll probably procrastinate a bunch like I did last summer, but as of today, I plan on marketing it as the next summer blockbuster. Look for it in Pottery Barns, Dockers Outlet Stores, and Victoria's Secrets near you. As for the rest of the year, who knows? The sky's the limit. Anybody else have future travel plans? Feel free to share! Howdy folks, Here's your Tuesday invitation to check out this week's Mr. Teacher column over on education.com. It seems like kids are able to remember material so much more easily when the material is put to a catchy song. So why can't we do that with EVERYTHING? In this week's column, I attempt a few lyrics that could help kids remember things like volume, the three branches of government, and spelling words with a silent k.
Raise your hand if you've ever heard THAT question asked by one of your students before. The kind way to answer this is, of course, "Not only is 50 NOT good, it's so bad that when you make a 50, it's going to rain because angels are crying." Recent discussion here in Texas has centered around those grades of 50. Currently, 50 is the lowest allowable grade on a child's report card. If little Jimmy did absolutely no work whatsoever during a grading period, he still gets a 50 on his report card. Now educators are crying, "Jimmy earned a zero, let's give him a frakkin' zero!" Thankfully, in third grade, I haven't had many kids who do absolutely nothing in class. Even the lazy ones do at least take their tests and do some of the class work. I've also been told that if a child is going to fail, I should give him/her a 68 or a 69 rather than a grade in the 50s. That way, if the child gets his act together, he could scrape together an overall passing grade for the semester. It will be interesting to see in the next few months how this debate turns out. Kids will have to actually EARN a 50 if the protesters win their case. I wonder what would happen if I did absolutely no duties of my job whatsoever. Would I still be given 50% of my salary? I'm going to the Final Four, baby! I was victorious in my quest on eBay, and I managed to score two tickets in the Alamodome!! Sure, I'll have to bring a box or two of Kleenex since I'll be in the nosebleed section, and the players on the court might look like ants, but I'LL BE THERE!!!!! Now, the only problem will be if the final four teams are North Carolina, Kentucky, Connecticut, and Michigan. I'll have a hard time rooting for anyone if that's the case. Not quite hump day yet, but it IS time for another Mr. Teacher column over on education.com! This week, the topic is that mystical aspect of maturing that third-graders SOMETIMES display upon coming back from winter holidays. Unfortunately, my kids this year don't seem to have metamorphosed just yet. Whose brain are you using? Benchmark tests are being given this week, and they are always an annoying interruption to our instructional schedule. We have to rearrange our rooms, proxy another class while they test, and lose hours of valuable class time. Today was the math benchmark. There was a question on this test that asked, "What is the best estimate for the height of a table?" The majority of kids in the third grade chose B, 30 ft. This reminded me of an afterschool jam session I was present for last year. One of the math department people from the district had come to our school to talk to all of the math teachers. One of the specific examples that she referenced was a question on a previously given TAKS test that said, "What is the best estimate for the length of a boot?" Of course we all knew that many of the kids had chosen 7 feet as their answer. The lady asked us, "So what do you think you should be asking a kid who chooses 7 feet as their answer?" I responded, somewhat reasonably I thought, "Can you show me how big 1 foot is?" My thinking was that they probably didn't know how big a foot was compared to how big an inch was. How very foolish of me. The lady practically ignored me and shouted, "You should ask that child, 'Whose foot are you measuring?'" Like some kid is actually going to picture Big Tex in his mind and think the question is about him. "Whose table are you measuring?" At some point today, Learn Me Good hit the 50,000 mark. That's pretty darn cool. Now if I could just sell that many books or get that many views on YouTube I would be set for life. There was a story in the Dallas Morning News yesterday about how several Texas school districts are handing pertinent information, such as Social Security numbers, over to a private software company. The information in question happens to be identifying data for kindergartners in these schools. Oh, and all of this is being done without the parents' permission. When I read this, I just had a mental image of little schoolchildren crying and claiming, "But I didn't get my chocolate milk yet! You gave it to someone else!" Please continue to tell people about Fractorix, as the more views it registers, the more visible it will become to people outside of the education field. And if you haven't yet left a comment over on YouTube, please go and do that! The Green Goblin, Dr. Octopus, and Sandman -- turns out they were nothing compared to the writers at Marvel Comics. 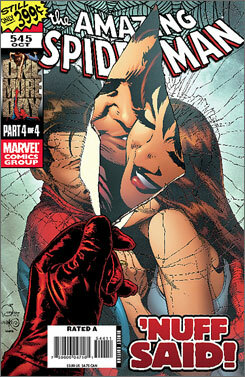 Spiderman is married no longer. I saw this story in USA Today today (echo echo), and I couldn't believe my eyes. 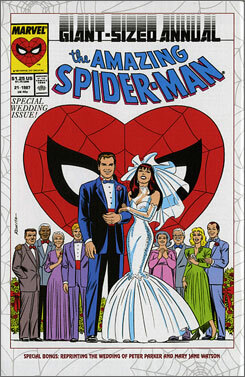 I used to be a big comic book aficionado, and I actually own the very special issue of The Amazing Spiderman where Peter Parker and Mary-Jane Watson tie the knot. Shy, nerdy geeks (with and without the proportional strength of the spider) everywhere celebrated vicariously as one of our own was able to score marital bliss with a hot redhead lingerie model. That was over 20 years ago!! But now, not only is the marriage over, but it's been annulled -- as only a comic book could annul it. A magical character has completely erased any evidence of the marriage. It's as if it never happened. I wonder if they will fit this to make Spiderman's meeting with Jackrabbit Man, who was bitten by a radioactive jackrabbit and gained the proportional strength and ability of a jackrabbit, null and void as well. This week's Carnival of Education is up and running, this time at the blog of The Columbus Education Association. The generous hosts there were kind enough to include TWO of my submissions this week -- the education.com column about The Bourne Congruency, AND the Fractorix video! Looks like lots of good articles over there, so check them out! I have to say, I am particularly proud of my Mr. Teacher column on education.com this week. As many of you know, I am a television/movie fanatic. So I seize any chance I get to write plot descriptions for fake movies and TV shows that are based on actual movies and TV shows! In the column this week, I suggest a few filler shows and movies for the gap that has been created due to the writers' strike. There are takeoffs on Die Hard, the A-Team, and the Bourne franchise, among others. Check it out, and if you like it, please leave a comment! Don't you just hate all of those prescription medication commercials on television nowadays? I don't want to see a turtle smoking a cigarette, I don't need to view people that look a lot like food items, and I most certainly don't need to see 60 year old men getting turned on by a little blue pill. So instead of witnessing any more of these commercials, I decided to make my own. I put it up on YouTube today. Check it out, and if you like it, please tell your friends about it! I realize that some people may have already gone back to school, but for me, this is my last weekend of freedom before classes resume on Tuesday. So I thought I would do something a little interactive. If you are a reader of this blog, please leave a comment with some details about how you spent your break. As for me, I slept in way too much, played way too much Guitar Hero, and spent way too much time surfing the net. Let's hear from everyone else! Alas, today is a very depressing time for many teachers, at least throughout the local area. This is the last week day that we have off before returning to class. The kids don't return until next Tuesday, but we have to report back to school on Monday. The problem is that Monday is not a teacher preparation day. I just learned this yesterday from a fellow teacher. I knew that we would be having some meetings on Monday, but I figured we would also have several hours to work in our classrooms. This is necessary, as we usually return from break to find that all of the furniture in our rooms has been rearranged for the purpose of cleaning the floors. But according to one of my other friends, who is on my school's leadership team, Monday is strictly a staff development day, devoted to nothing but staff meetings and seminars. January 22, on the other hand, is the designated teacher preparation day. January 22 is a Tuesday, immediately following Martin Luther King Jr. Day which is a no-school Monday. So two weeks AFTER we return from Winter Break, we get a day to rearrange our classroom and get our papers in order. It's just nice to know that the district has its priorities in order. Well, time for me to get out of here and go decorate my Christmas tree and string up the lights on my house! This week's Carnival of Education is hosted by Joel over at So You Want to Teach? The good fellow even put my Christmas update in as his number 2 choice of the week! It's good to be number 2. Hello everyone, Welcome to the year 2008! Who knew this tiny third rock from the sun would still be around? Since it is Tuesday, I feel the need to throw a few pointers towards the current Mr. Teacher column over on education.com. This week, it's all about the New Year's resolutions. See if you can pick out the actual resolutions from the facetious ones. Also, I decided that 2008 is going to be the year that I finally give eBay a try. I've been monitoring NCAA final four tickets for a month or two now (with no success), but now I've actually got an item up for sale! Go on over there and bid a couple of hundred dollars. I'll be your best friend. Happy new year everyone. Don't forget to continue signing the guestbook from a couple of posts ago!